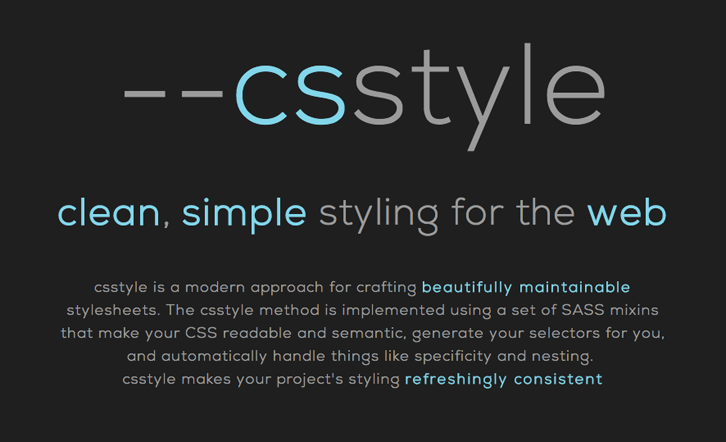 Csstyle is a modern approach for crafting beautifully maintainable stylesheets. The csstyle method is implemented using a set of SASS mixins that make your CSS readable and semantic, generate your selectors for you, and automatically handle things like specificity and nesting. csstyle makes your project’s styling refreshingly consistent. To get started just import the csstyle mixins, add an id=”csstyle” to your body tag (used for automatic specificity handling), and you’re set. You’ll be pleasantly suprised how much better these simple building blocks make writing CSS. Happy styling!